The Charleston prosperity parade continues to march forward, providing jobs and management challenges for policymakers; this change in economic fortunes also shows us a clear and exciting opportunity to resolve the cruise ship controversy for good. Let’s give the issue a fresh start and have representatives from impacted neighborhood associations and their legal counsel, the Historic Charleston Foundation, the Preservation Society of Charleston, the port officials, a representative of the cruise ship industry and state and local officials sit down with those who want to build a new hotel on Meeting and Huger streets. The policy chessboard has been far too narrow, and we need to look at how Charleston is growing and where the tourism industry is expanding. This paperzine understands that our suggestions will not answer all questions and concerns; we offer a new vision to stimulate discussions. We have advocated for a while that the cruise ship terminal should be located near the Ravenel Bridge so that the influx of passengers may benefit the greater Lowcountry’s economy and be less of a “fire hose” of tourism in the Market area. The hotel proposed for Meeting and Huger is one of many planned hotels that will need new occupants; some of these will come from cruise ships. If the Union Pier terminal goes to the north and allows that valuable site to prosper with residential and business growth, elected officials and cruise critics should offer support for reasonable growth in cruise ship traffic and end all legal action. If the traffic is dispersed in a manner that reduces congestion downtown, the neighborhood associations and preservation groups can secure a fair deal and allow tourism to prosper in places where it has never been. The investors behind the proposed hotel at Meeting and Huger streets have an opportunity to step up and bolster their economic future while helping guide the compromise on cruise ships. If we remain in the current conflict paradigm with the cruise ship controversy, we will remain mired in the past while smaller deals are struck on tourism growth. We need a bigger vision. Within these negotiations, all parties will have to compromise and the South Carolina Ports Authority can pick up public support for its other plans by being big enough to cast aside its current Union Pier terminal plans and set its course for the cruise industry in a new direction. Carnival’s choppy seas- an informative P&C editorial about the cost that our government incurs when a cruise ship requires a rescue. Controversy roils the waters of the Charleston, S.C., harbor and others in the US. At issue: Is the ever-expanding cruise ship industry a cost or benefit to port cities? And how much should taxpayers chip in for port facilities versus what they can expect in return? Since 2010 the 2,000-passenger Carnival Cruise ship Fantasy has been based in Charleston at a terminal, which, according to the Post & Courier, is now considered old and outdated. Under debate is whether a new, $35 million cruise ship terminal should be built. There seems to be a pattern here. The city of Charleston hasn’t imposed any rules about how many and what size ships Carnival Cruise Lines can bring to the passenger terminal. City Council just knows things will never get out of hand. And while the United Nations’ International Maritime Organization sets cruise ship standards for an array of areas, they are just guidelines. When cruise lines ignore them, there is no penalty. Further, the U.S. Coast Guard can inspect cruise ships when they are in a U.S. port, but once they are three nautical miles from shore, the Coast Guard has no authority. In short, the cruise industry enjoys extraordinary latitude that few industries do. Compare it, for example, to the airlines and the myriad rules and laws imposed on it. The differences are evident in the wake of a recent fire that disabled the Carnival Triumph and caused 4,000 people to endure an extremely unpleasant — and unsanitary — five days while the ship was towed to Mobile, Ala. Although the ship uses American ports and carries mostly American passengers, and was towed to this country, the investigation into the accident must be done by Bahamian officials because Carnival Cruise Lines is incorporated in Panama, its offices are based in Miami and its ships fly under the Bahamian flag. Last year, after the Concordia, also a Carnival Cruise Lines ship, ran aground and partially sank, killing 32 people, Sen. Jay Rockefeller, D-W.Va., called for a hearing before the Commerce Committee to examine deficiencies in the cruise industry’s compliance with federal safety, security and environmental standards. Neither the cruise ship Fantasy, which is homeported in Charleston, nor any cruise ship that calls here, is bound by city regulations. Failing to put such regulations into place is an unnecessary risk for Charleston to take. Carnival Cruise Lines, like the rest of the industry, might not be accustomed to binding rules and regulations, but Charleston deserves assurance that cruise ships will not erode the community’s health, culture and livability. The unpredictability of the cruise ship industry, as evidenced by the Triumph’s sad story, should convince Charleston’s mayor and council to support reasonable cruise ship restrictions, including shoreside power and a cap on the number and size of ships that come to Charleston. CHARLESTON, S.C. — In this Southern coastal city that runs on history and hospitality, a raucous civic debate belies a genteel veneer. Like several communities that hug the nation’s coastline, Charleston is struggling to balance the economic benefits of cruise ships against their cultural and environmental impact. Last week’s debacle aboard Carnival Cruise Lines’ Triumph, in which an engine fire stranded 4,200 people in the Gulf of Mexico for five days, has done little to deter those civic leaders who believe that building a new $35 million cruise terminal will be a great boon for this port city. But for people like Jay Williams, a homeowner in the historic district who writes a blog for Charleston Communities for Cruise Control, a preservationist group, the nightmare on the Triumph is one more piece of evidence in the case against a fast-growing form of travel. “Cruise ships are sardine cans packed with passengers and crew, susceptible to horrific accidents that instantly can put thousands at risk for their lives,” he wrote after the episode. Cruising has never been more popular or affordable, with its mix of easy travel, exotic locales and onboard amenities that include cooking schools and simulated surfing. In 2012, cruise ships carried 20 million passengers, the majority of them from the United States. With 14 new cruise ships entering the water in 2014, the number of passengers is expected to increase by as much as 8 percent. But on the shores of the nation’s most charming cities and towns, the relationship is complicated. In Key West, Fla., voters will decide this fall whether to spend $3 million toward widening a channel that leads to the city’s ports, where 350 cruise ships arrive each year. A deeper channel would allow a new, larger class of cruise ships to dock. Business owners and residents worry that the dredging would hurt fragile coral reefs and overwhelm the town. In Alaska, state lawmakers are expected to decide Wednesday whether to roll back tough wastewater standards mandated by voters in 2006. If the proposal, backed by Gov. Sean Parnell, is approved, the 36 cruise ships that travel Alaska’s waters each year will be able to discharge waste water with less treatment than it currently receives. Michelle Ridgway, a marine ecologist who serves on the state science panel for cruise ships, watched as Alaska cruise ship traffic grew to about a million people a year and changed her hometown of Ketchikan. “The pulp mill closed and the place turned into Disneyland,” she said. Charleston’s cruise ship debate seems small by comparison, but it is deeply felt. The Fantasy — at 23 years old, the oldest ship in the Carnival fleet — has been based in Charleston since 2010. It slides into port once or twice a week. Some 2,000 passengers, most of whom have driven in from nearby states, walk through an aging terminal, climb aboard and sail off to the Bahamas or the Caribbean for a few days or a week. Other cruise ships sometimes stop to visit the city, too. The South Carolina Ports Authority wants to build a new ship terminal that port officials say will handle only one ship at a time, but the frequency of ships could increase. Those dedicated to preserving a section of town whose buildings date to the 1700s worry that a new terminal will bring a damaging concentration of tourist traffic and larger cruise vessels. Port officials point out that cruise ships are a tiny slice of the city’s shipping traffic. More than 1,700 vessels use the port every year, and only 85 of those are cruise ships. And cruise traffic, they say, is worth $37 million a year to the region. But this city takes its preservation seriously. The specter of more cruise ships has spawned three state and federal lawsuits and has placed the city’s historic district on the World Monument Fund’s list of most endangered cultural sites. He points out that the city will get a new waterfront park, and that it has a voluntary agreement with the port that caps the number of ships a year at 104. But mostly, they want the port to consider two other spots along the waterfront, which the mayor and port officials say are unworkable. Not that cruise ship passengers worry too much about the impact their vacations have on local communities. Battles over local or federal legislation, like the Clean Cruise Ship Act, which died in Congress in 2010, are not as interesting as which name-brand chef is going to open a restaurant on board. “Our audience doesn’t really respond to the municipal-level battles or the environmental stuff,” said Dan Askin, senior editor at cruisecritic.com, a consumer Web site dedicated to cruise ships. The cruise ship industry has less comprehensive oversight than the airline industry, which is regulated by the Federal Aviation Administration. Ships fly under foreign flags and their parent companies are incorporated overseas, leaving regulation to a patchwork of federal, state and, rarely, local laws. A cautionary tale might be found in Mobile, Ala., where Carnival Cruise Lines hauled the lifeless Triumph last week. Mobile would gladly take any cruise ship traffic at all. The port and the city romanced Carnival Cruise Lines for years. In 2004, after the city borrowed $20 million to build a terminal, Carnival finally agreed to the relationship and based a ship there. In 2007, Carnival named Mobile its port of the year. Things were going so well that in 2009, Mobile spent $2.6 million on a new gangway. Two years later, Carnival left. The location just wasn’t popular enough, it said, and rising fuel costs made Mobile a less efficient port than New Orleans. VENICE, Italy — More than two dozen residents gathered in a bar on the east side of this city earlier this month to plot the course of their year-old effort to fight the ever larger cruise ships arriving here. In a corner, a slide projector flashed images of many of them sailing small boats, waving “No Grandi Navi (No Big Ships)” flags. The talk centered on strategies to push back at cruise ships when the mega-ships return in bulk in a few months. Some specific concerns include the ships clogging the city’s canals, polluting the lagoon’s delicate marine environment and harming the foundations of the city’s historic architecture. The debate over these ships, which can dwarf this medieval city’s skyline, heated up further after the Costa Concordia cruise liner ran aground off the Italian island of Giglio last year. Clearly, concern over cruise ships isn’t limited to Charleston. But Charleston soon will take center stage in the international debate over how best to balance cruise tourism and preservation concerns in the historic port cities where the ships often call. On Feb. 6-8, the Francis Marion Hotel will be the scene of an international conference hosted by the World Monuments Fund, the Preservation Society of Charleston and the National Trust for Historic Preservation. The event isn’t designed simply to bash the cruise ship industry, said Erica Avrami, research and education director with the World Monuments Fund. In fact, Craig Milan, a Miami-based consultant to the cruise travel industry, will give the keynote address the first night. But she said the tourism must be sustainable, too. Charleston isn’t necessarily the city with the greatest cruise ship problem. Evan Thompson, director of the Preservation Society of Charleston, said Venice is a better example of the potential harm from cruise ships, and Venetian architect Paolo Motta is set to deliver the event’s main lecture on Feb. 7. Other cities have had their own issues, such as Mobile, Ala., which invested more than $20 million in the Alabama Cruise Terminal only to see its main cruise line pull out, posing a financial headache in covering the debt. Alaska, Mexico and Costa Rica have their own challenges and are scheduled to send speakers to the event. “We suddenly realized there really hasn’t been a lot of concentrated dialogue on best practices when it comes to historic ports,” she said. Anthony C. Wood, a New York-based preservation educator, historian and activist, has visited Charleston regularly for more than a decade. He recalled waking up one morning in his room at the Francis Marion Hotel. Charleston might not have the world’s greatest problems with cruise ships — the number calling here in a year is still well below what even opponents concede is a reasonable limit — but it is the first historic city to be added to the World Monuments Fund “Watch List” specifically because of the threat of cruise ships. The cruise debate has raged here for a few years and has triggered multiple lawsuits, two of which are still pending. Dozens of homeowners in the historic district fly banners with a slash mark over a cruise ship’s smokestack. A coalition of residents and environmental and preservation groups are pushing the city and port to enact a legally enforceable cap to ensure that no more than an average of two cruise ships call here in a week and that no ships arrive with more than 3,500 passengers. They also want cruise ships to plug into the city’s electrical grid at port instead of burning their own fuel to limit air pollution, and they want the city to collect a fee to offset its cost of managing cruise visits, among other things. Avrami said the conference will capture the discussions and publish them online, but it has another goal. “In the long term, we’re hoping that having this symposium in Charleston will help to foster better dialogue and help bring more knowledge to the table so negotiated solutions can be found to the existing situation in Charleston, which I know is rather tense,” she said. Wood, who plans to participate in the conference, said Charleston has built an incredible tourism brand — it has earned the No. 1 spot in the world in Conde Nast’s most recent visitors’ poll — but there’s no guarantee it will remain on top. But the prospects for a breakthrough here are uncertain. While the conference has sought a range of perspectives, neither State Ports Authority officials nor Charleston Mayor Joe Riley — the ships’ greatest defenders — are set to participate. Many local opponents are. William Cook, National Trust for Historic Preservation, Washington, D.C.
Martha Honey, Center for Responsible Tourism, Washington, D.C.
Marcie Keever, Friends of the Earth, Berkeley, Calif.
What: Harboring Tourism: A Symposium on Cruise Ships in Historic Port Communities. Where: Francis Marion Hotel, King and Calhoun streets. Hosts: Preservation Society of Charleston, World Monuments Fund and National Trust for Historic Preservation. Cost: $300 for students and society or trust members; $350 for non-members for the full conference; $25/$30 for only Wednesday’s session; $75/$100 for only Friday’s. more info: Visit PreservationSociety.org or call 722-4630. Those who want reasonable limits to Charleston’s cruise industry should be allowed to present their case in court, according to a “referee” appointed to analyze their complaints and make recommendations to the S.C. Supreme Court. That is good news. The contentious cruise issue has pitted the State Ports Authority and Mayor Joe Riley against citizens, preservation and conservation groups, and neighborhood associations. It needs a thorough airing. The divide between the two sides isn’t shrinking. Carnival’s cruise ship Fantasy is home-based in Charleston. The mayor says that is a financial plus for Charleston and says the SPA’s pledge not to grow the business without first going to the public is good enough for him. Citizens and groups involved in the lawsuit say they haven’t seen the financial advantage. They want enforceable, reasonable limits to the size and number of cruise ships that visit Charleston, and the frequency of their calls. The SPA hasn’t agreed to such limits, and the city hasn’t pushed for them. Circuit Judge Clifton Newman indicated that the court should hear charges that noise, congestion, traffic and soot from cruise ships are a nuisance to the peninsula. If the Supreme Court heeds his advice, the case will be heard in a lower court. But, not surprisingly, Judge Newman also recommended the Supreme Court dismiss charges regarding Carnival’s environmental impact, saying the cruise line meets federal guidelines. Further, he thinks the court should reject the notion that cruise ships should be governed by the city zoning ordinances. Those seeking enforceable controls over the cruise industry, despite Judge Newman’s legal opinion, see the cruise ships as floating hotels for 3,500 that dwarf downtown hotels but don’t have to follow the rules hotels do. The advocates for cruise control are not a small group of whiners and “snobs,” as cruise supporters have charged. And they are not just local. The National Trust for Historic Preservation has put Charleston on a watch list as an endangered place because of the cruise industry’s impact. Both Ansonborough and Charlestowne neighborhoods fear losing National Register status. The Preservation Society is concerned lest its historic easements could be impaired. The Charleston County Medical Society and the S.C. Medical Association have both resolved that emissions from cruise ships are a threat to people’s health. Meanwhile, more than a half-dozen neighborhood associations and preservationists last week asked the Department of Health and Environmental Control to rescind a permit allowing the State Ports Authority to drive piles for a new cruise terminal. It is a pity that the cruise question ended up in litigation. It could have been averted in an efficient and friendly way with some simple legal limits. Certainly, the city has gone the extra mile in regulating other less intrusive tourism-related operations. Optimally, Judge Newman’s recommendation will force the issue of regulating cruise ships to protect what preservationists have dubbed “the delicate balance” of tourism, business and residential living. OK, Carnival, write 1,000 times: I will not pollute the water and the air. I will not pollute the water and the air. Something has got to drive home to Carnival Cruise Lines that it is not all right to send the Fantasy to the port of Charleston when it has scored an F for its environmental footprint. Environmental advocacy group Friends of the Earth’s recently released Cruise Ship Report Card compares 15 major cruise lines and 148 cruise ships. The good news … sort of … is that Carnival Cruise Lines has improved from an F to a D+. Marcie Keever, oceans and vessels project director for Friends of the Earth, said Carnival’s grade improved in part because it installed shoreside power on two of its ships. “Imagine if Carnival implemented these changes across its entire fleet,” she said. At present, imagination will have to suffice in Charleston, where the Fantasy is homeported. The ship scored an F in reducing air pollution. It also scored an F in sewage treatment, for an overall grade of F. Air emissions have provided the most cause for complaint locally, by far. The report card indicates that Carnival Cruise Lines could do a better job than it has done — and particularly for the Fantasy. And those improvements would benefit the 3,530 people who might be aboard and the people on shore who breathe the same air. Adding shoreside electrical power, which allows ships at berth to cut off their emissions-spouting diesel engines, would be a good start. And now would be a good time, since state environmental regulators recently approved the port’s proposed new passenger terminal at Union Pier, which the Fantasy will use. Shoreside power would almost assuredly pull up the Fantasy’s sad grade. Charleston City Council, which has so far declined to put any meaningful restrictions on Carnival, should take note of the report card. Viewed in context with local complaints about the Fantasy, it offers compelling reading — and more evidence that the city shouldn’t be a passive host to the cruise industry. WHITTIER, Alaska — The gleaming white Sapphire Princess docked in this deepwater port this month, unloading its passengers and taking on 2,600 more guests headed first to Glacier Bay and eventually to Vancouver, British Columbia. Every day of that trip, the cruise ship — whose website invites passengers to see Alaska’s “pristine landscapes” — will emit the same amount of sulfur dioxide as 13.1 million cars, according to the Environmental Protection Agency, and as much soot as 1.06 million cars. “Suit could derail cruise terminal,” Charleston Mercury. P&C, July 3, 2012, R. BEHRE. Banners fly against ship soot, P&C, July 3, 2012, ROBERT BEHRE and BRENDA RINDGE. Hearing set in Carnival Cruise lawsuit, Charleston Regional Business Journal, June 4, 2012, MATT TOMSIC. A judge set a hearing next week for a lawsuit between conservation groups and Carnival Cruise Lines so that attorneys can brief the judge on the case’s progress and pending motions. On May 24, the S.C. Supreme Court appointed Judge Clifton Newman as a special referee, and Newman set the hearing for June 14. At the hearing, attorneys will brief Newman on the status of several motions that are pending before the state Supreme Court. Newman will then prepare a report for the court and will provide recommendations for rulings on motions by defendants to dismiss the case and by plaintiffs to file another reply to the defendants’ motion. The state’s highest court took the cruise lawsuit out of Charleston County court in January after granting original jurisdiction in the case. The lawsuit — filed in June 2011 by the Southern Environmental Law Center on behalf of neighborhood associations and conservation groups — argues Carnival Cruise Lines is breaking local zoning, nuisance and environmental permitting laws. The legal complaint has 12 counts and wants Carnival to go through the processes required of Charleston tourism-related businesses. Charleston, SC: Late last week, the South Carolina State Supreme Court appointed a judge to review the S.C. State Port Authority, City of Charleston and Carnival Cruise Lines “Motion to Dismiss” the lawsuit filed last June by the S.C. Coastal Conservation League, Historic Ansonborough Neighborhood Association, Charlestowne Neighborhood Association and the Preservation Society of Charleston against Carnival Cruise Lines, the most frequent violator of existing local ordinances. This step is viewed by the plaintiffs as a welcome development….they believe that the SPA, City and Carnival probably wanted the State Supreme Court to simply dismiss the case out of hand. Instead, there will be an actual hearing at which time the judge will hear arguments and review all the pertinent documentation that has been filed. Once the review is completed, the judge will make a recommendation to the Supreme Court which they will take under advisement. The judge is well respected and a fair hearing is anticipated. NOTE: While not affiliated in any way with this lawsuit, Charleston Communities for Cruise Control does agree with the premise that existing local ordinances should be adhered to by the cruise ship industry. C4 also calls for regulation of how the industry operates in Charleston are needed in order to protect the delicate balance between tourism, residential and everyday life for those who live and work in the area. The future isn’t what it used to be, Charleston Mercury, May 16, 2012, Editorial, JAY WILLIAMS. Mayor Joseph Riley and supporters of an unregulated cruise ship terminal at Union Pier advanced their key arguments during a hearing conducted last month by the federal Office of Ocean and Coastal Resource Management. The “we-know-better” argument went like this: “I was born in Charleston, my family has worked on the docks for years … and you got here late.” Or, “This has been a maritime city for 300 years…” This argument would be terrific if the maritime traffic and the ships were remotely the same as 300 years ago. Or even 30 years ago. But ships today don’t look like the Spirit of South Carolina. And, cruise ships have nothing in common with cargo shipping except that both ships float. Cruise ships have thousands of passengers who must be accommodated and managed; cargo ships don’t. The modern cruise industry was born just 40 years ago when Carnival Cruise Lines was formed. Carnival’s promise to “give the passenger a fun-filled vacation at a price they can afford” revolutionized the industry. Unlike the “past,” today’s cruise ships are carefully constructed floating cities, carefully designed to capture passengers’ interest, attention and money — beginning with the lobby bar up to the top deck spa, with casinos, upscale restaurants, “shopping streets,” pools, waterslides, nightclubs, live shows, music and more beckoning from every deck in between. Sure, there were passenger ships 100 years ago, but they were tiny compared to Carnival’s 100-ship fleet. The Titanic, the largest ship afloat in 1912, weighed 46,000 tons, had 9 decks, and was 882 feet long. Compare that to the Carnival Fantasy, home-ported in Charleston and one of Carnival’s smallest ships: 70,367 tons, 14 decks, 855 feet long. But the Fantasy is Carnival’s oldest ship. The newer Carnival Dream-class of ships is far larger: 130,000 tons, 1004 feet long with 3,646 passengers and crew of 1,367. Somehow Mayor Riley had the temerity to say, “It is the same business, the same cruise activity, that is currently going on in Charleston.” It’s not “the same business.” The cruise industry grew eight percent in 2011 and will grow another six percent this year! The cruise industry is like nothing from the past — new ships are vastly larger in size and scale. As Boeing’s new 787 “Dreamliner” dwarfs the old 707, ever-larger cruise ships should only be expected here, especially with the widening of the Panama Canal. Let’s turn this line of discussion on its head. Charleston could put the cruise terminal anywhere — almost 50 percent of the South Carolina State Ports Authority terminal space is unused or underused. So why would any historic city risk building a cruise terminal downtown after witnessing the environmental damage already done by cruise ship terminals near the hearts of Venice, Key West and other cities? What about the “Jobs Argument?” No one actually said, “Jobs, not snobs,” but they came close. The reality is that there will be just as many jobs — likely more — if the terminal were moved north to Columbus Street or to the Veterans Terminal. And any economic benefits from cruise ships would be increased. Why? Because there the demands for regulations and controls would be reduced — the larger ships could come in without damaging historic Charleston or displacing other tourists. The “Jobs Argument” is specious. There was the nonsensical “no-soot argument.” “I work with 85 percent of the cruise ships that come in here, and I park my white truck right next to them. It never gets soot on it.” Perhaps, sir, that’s because the top deck of the ship rises 130 feet above the water — and the Fantasy’s tail — where the soot belches out — rises still higher. Do cruise ship passengers get soot on them? No. But that soot — with heavy carcinogen-laden particles — drifts over Ansonborough. Park your white truck there. There was the “it’s only a one-berth terminal” argument. That’s not true, either. The pier at Union Pier is 1,800 feet. You now know that the Fantasy is 855 feet long. You do the math. Apparently no one else can. And, finally, consider the argument of “Five pilings are all we’re talking about.” Five pilings didn’t bring 200 people out during their dinner hour. The new ship terminal would be far bigger than the older one, facilitating an increasing, uncontrollable level of cruise ship traffic and tourism that, on top of traditional tourism, will overrun Charleston’s geographically limited space and resources to handle. The proponents didn’t mention the recently released Miley & Associates study on Charleston cruise ship tourism. That study shatters the illusion that home-ported cruise ship tourism brings millions into the local economy: Fantasy cruise passengers spend just $66 a day vs. $718 a day for traditional tourists. Worse, the Fantasy is not provisioned locally, but from Florida, and most of the passengers who spend a night before boarding go to less expensive North Charleston motels that give them free weekly parking and a shuttle to their “Fun Ship.” Cruisers come to Charleston mostly to sail away and spend their money elsewhere. The array of evidence presented during the past year allows for only one conclusion. Once a cruise ship terminal is built downtown at Union Pier, the result will be a historic, environmental, cultural and financial disaster for downtown and Historic Charleston. If you’re looking back at the past 300 years of maritime history, you won’t believe that. But if you’re looking ahead at the growth of the modern cruise-tourism industry, you will. Preservation Society’s Seven to Save list highlights important landmarks, P&C, May 14, 2012. What does a tabby ruin on Wadmalaw Island have in common with the United Order of Tents Building at 73 Cannon St.? Both have been listed on the Preservation Society of Charleston’s new “Seven to Save” list. The list highlights what the society considers are the Lowcountry’s most pressing preservation issues. It also shows the society’s growing interest in calling attention to historical sites well outside Charleston’s Old and Historic District. In fact, the only site in the historic district that makes the list is the Ansonborough neighborhood, and that’s being listed not because of any imminent threat to a building but because of concern over the livability effects from both a new cruise ship terminal and a large-scale Gaillard Auditorium makeover. The new list also shows the society’s constantly evolving outlook as to what’s a good building, one worthy of the city. The greatest example of this may be the vacant old county library at the northwestern corner of Marion Square. Its modern design originally was attacked by the Preservation Society (and others). Now the group wants to save it — partly because of its historical significance as Charleston’s first public buildings designed for integrated use and partly because it opposes plans for a tall, new hotel at this site. (The society has sued the city over that hotel’s zoning, and the S.C. Supreme Court could rule as early as this week). But Evan R. Thompson, executive director of the Preservation Society of Charleston, says the building also has an underappreciated architectural quality, including pink marble slabs cut from the same block so they show a pattern of marks and imperfections. Charleston’s “sweet shops,” one-story small commercial buildings mostly found along residential streets north of Calhoun Street. One example is the vacant one at 571/2 Carolina St. Thompson says these are not well protected, nor is there agreement of how they should best be renovated and used. The Lewis Christian Union Cemetery, a largely abandoned burial ground founded in the late 19th century by a black burial society. It lies near Magnolia Cemetery, and the society already held one clean-up day there recently to remove weeds, trees and trash from the gravestones. Tabby ruins in Charleston County. Thompson says the society would like to see a survey of how much of this early building material — made from oyster shells, lime, sand and water — remains in the Charleston area. Once that’s known, the society could try to get the sites on the National Register of Historic Places. Charleston’s historic 11th Ward, an early 20th century neighborhood along the eastern edge of Interstate 26. Charleston’s midcentury modern buildings, such as the old library noted above, the Federal Building on Marion Square that’s being renovated into a hotel, the College of Charleston’s College Lodge dorm on Calhoun Street and the former Chase Furniture building at 414 King St. Thompson says it’s important that preservationists start talking about these buildings in more depth rather than simply saying whether they like them. The Ansonborough neighborhood, which some feel is under threat from both cruise ship traffic nearby and a plan to expand and reskin the Gaillard Auditorium. The United Order of Tents building, one of the largest buildings on one of the largest lots in Charleston’s Cannonborough neighborhood. The 19th century building is owned by a secretive society that dates to the Civil War era, is run by black women and was founded to help those in need. Its membership has aged, and the building is in disrepair, with its upper floors no longer used. But Thompson says much of the building’s fabric survives, despite an insensitive concrete block addition. Thompson says the society is trying to do right but is facing prosecution from the city’s Livability Court, which tackles blighted, unmaintained properties. He notes the city owns properties in worse shape than this and should back off. “The city needs to take itself to Livability Court before it takes the United Order of Tents to Livability Court,” he says. P&C, May 13, 2012, Editorial. Those local people who have concerns about the negative impact of a growing cruise industry are in good company. Worldwide company. Company in such places as Venice, Italy; Key West, Fla.; and Dubrovnik, Croatia. Preservationists from those and other places around the globe are so concerned about the ill effects of cruise ships on the cities where they call that they are planning to gather in Charleston in November to learn from each other. In the lead will be the Preservation Society of Charleston, fulfilling its role as an advocate for maintaining the city’s historic nature and buildings. A network of people fear that the traffic, congestion, pollution and visual impact of increasinlgy large cruise ships would damage the city. They want reasonable, enforceable limits. Still, Charleston Mayor Joe Riley told reporter Robert Behre that those who want the industry regulated are a small minority, and that they have not compromised plans for a new cruise ship terminal. The SPA is proceeding with its plans with the city’s support. The race has begun. The city and SPA have no plans to delay their business plan. Preservationists, neighborhood groups and conservationists want to slow the process until their concerns have been addressed. National Trust for Historic Preservation Director Stephanie Meeks spoke to the Preservation Society on Thursday. She mentioned the cruise issue only briefly, but what she didn’t say spoke volumes: She didn’t say that the Trust has removed Charleston from its watch list for endangered places. It remains there, just as it remains on a similar list of the World Monuments Fund. The question is whether advocates for cruise limitations can forestall SPA long enough for the November conference to produce recommendations. Ms. Meeks said that Charleston has set standards for historic preservation. There is reason to hope that the international conference here will come up with ideas worth waiting for. The city and the SPA should be as receptive as the preservation community. “Cruise Foes zero in on Charleston“, Post and Courier,May 11, 2012, ROBERT BEHRE. Charleston is not alone in grappling with the potential harm from a growing cruise ship industry, and the city will host an international conference of preservationists this fall to delve into the issue. The conference was announced Thursday during a Preservation Society of Charleston meeting, where National Trust for Historic Preservation Director Stephanie Meeks spoke. “Charleston is an internationally important city, and there are a lot of cities that have even more experience in cruise tourism than Charleston has,” she said. It was Meeks’ first public appearance here since the National Trust placed the city on a new “watch status” because of concerns that its expanding cruise ship tourism could jeopardize the city’s historic character. The trust has teamed up with local preservation groups and others to address concerns over the ships, such as their related traffic, congestion, pollution – even their visual impact on the skyline. She offered relatively few comments on the controversy, but Preservation Society Executive Director Evan Thompson announced that the international conference would be held Nov. 14-16 at Charleston’s Francis Marion Hotel. He noted that the issue is relevant in Key West, Fla.; Mobile, Ala.; and in much-older cities such as Venice, Italy, and Dubrovnik, Croatia. The World Monuments Fund, which also has expressed concern over cruise ships’ impact in Charleston, is a partner for the fall conference. Charleston Mayor Joe Riley, who wasn’t at the meeting, has drawn criticism from preservationists for not doing enough to regulate cruise ships. Earlier Thursday, Riley said the city and the State Ports Authority are moving ahead with plans for a new cruiseterminal that will spur the redevelopment of Union Pier. He said the industry’s legal and political opponents have not done any damage. Riley also noted that the city’s cruise ship industry isn’t seeing unabated growth; 84 ships are set to call here this year, down from 87 last year. Still, the society placed the Ansonborough neighborhood on its new “Seven to Save” list of historic sites worthy of attention. Thompson said the listing is partly because Ansonborough is so close to the cruise terminal and partly because it is home to the Gaillard Auditorium, which is set for a $140 million makeover that the society wants scaled back. Meeks said many historic cities have looked to Charleston to set a standard in preservation. “Charleston cruise-ship opponents seize opportunity to battle new passenger terminal“, P&C, April 19, 2012. Opponents of Charleston’s cruise-ship industry believe the State Ports Authority’s need for a permit to build a $35 million passenger terminal presents an opportunity to stop the plan. About 200 people, with a clear majority opposed to the new terminal, turned out Wednesday night for a hearing in North Charleston on the Office of Ocean and Coastal Resource Management permit. The permit would allow the SPA to install five additional pilings under Union Pier on the Cooper River. The pilings would support elevators and escalators that would be installed in an existing warehouse slated for conversion to the new passenger terminal. Cruise opponents said the state must consider every impact cruise ships are having in Charleston before deciding on the pilings permit. “Simply put, if this project goes through, it could mean the end of the Ansonborough neighborhood and many others,” said Kathleen Summerall, a neighborhood resident. Several downtown neighborhood associations have joined with environmental, health and preservation groups to oppose the cruise terminal and call for limits on the existing cruise business. A lawsuit is pending before the state Supreme Court. Cruise terminal supporters, including Mayor Joe Riley and a number of people with port-related jobs and businesses, spoke in favor of the plan. Existing cruise-ship operations would move from the south end of union pier, near Market Street, to the north end, near Laurens Street. “It is the same business, the same cruise activity, that is currently going on in Charleston,” Riley said. He said the plan has the “overwhelming support” of most residents, would reduce the current impact of the cruise business, and would open 35 acres of SPA property to beneficial redevelopment. 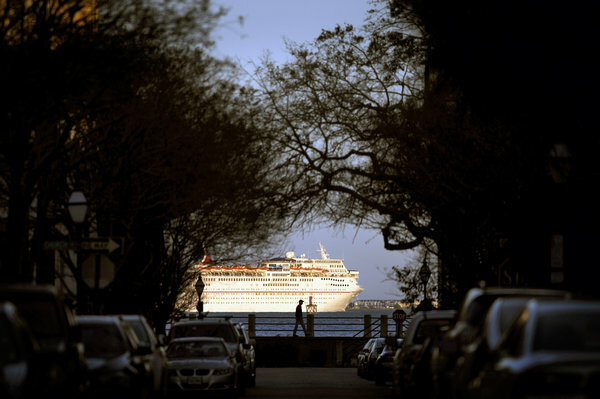 Opponents say cruise ships pollute the air as they run their engines while in port, disturb city residents with their horns and passenger announcements, and cause traffic problems when thousands of passengers arrive and depart by car. Coastal Conservation League Director Dana Beach said having a cruise ship in port is like putting a dirty power plant on the edge of a residential neighborhood. The new passenger terminal would be far larger than the current one, which Beach and other opponents fear could lead to more and larger cruise ships. The city and SPA have agreed to cap cruise-ship visits at an average of two per week, and 84 are planned this year. SPA President and CEO Jim Newsome did not speak at the OCRM permit hearing, but in comments after an SPA board meeting Tuesday, he said his pledges about the cruise business can be relied upon. “I’m not going to be made a liar over something that accounts for five percent of our business,” he said. The Ansonborough and Charlestowne neighborhood associations want the new passenger terminal relocated, possibly to the SPA’s Columbus Street terminal outside the downtown area. Newsome and other SPA officials have said that idea’s a non-starter, partially because Columbus Street is busy and growing port used to ship BMW vehicles and other non-container cargo. Port worker James Pinkney Jr., vice president of the dockworker’s union, said the project should move forward. He said opponents are hypocritical, because when he was growing up in an Ansonborough housing project, he heard no objections to projects that environmentally harmed the area. Downtown resident Courtenay McDowell said cruise-ship operations have approached a tipping point in the livability of the area. “I speak of what’s happening today in fear of what will happen tomorrow, with more cruise ships,” she said. There is no deadline for a decision on the permit from the Office of Ocean and Coastal Resource Management. Couple recognized for urban planning, P&C, April 2, 2012, Robert Behre. For architect Andres Duany, who played a key role in founding the new urbanism movement, there is no city more beautiful than Charleston. Duany didn’t just say that to be nice because he and his wife and collaborator Elizabeth Plater-Zyberk recently were presented with the College of Charleston’s Simons Medal of Excellence. He said it because this city has influenced the work of their firm, Duany Plater-Zyberk and Co., for three decades. Duany explained that Charleston has struck a great balance by building great public and private realms. The city has found a balance between the beauty of streets, sidewalks, parks and other public spaces and the beauty of private spaces, such as homes and gardens. He noted while cities such as New York and Paris have grand public realms, their private realms often consist of dank, dark, little apartment spaces. DPZ’s architecture and urban planning has borrowed heavily from Charleston since at least 1983, when Charleston Place began taking shape in Boca Raton, Fla., complete with single houses inspired by Charleston’s. The Lowcountry’s influence continued through DPZ’s later developments such as Windsor in Vero Beach, Fla.. and Seaside, Fla., also known as the setting where the movie “The Truman Show” was filmed. Locally, the firm is best known for helping to shape Mount Pleasant’s I’On neighborhood. Plater-Zyberk spoke of the importance of preservation, nothing that it’s the foundation of community-building. “History of the place, that will always be shared by the people in the place,” she said. Also, she said older buildings, particularly those built before World War II, convey more of a sense of place because their construction materials came more from local sources. Also, older buildings can point the way forward. “Repeating history in new building is something we should be more willing to do,” she said. The Simons Medal of Excellence is named in honor of the late Charleston architect and author Albert Simons to recognize those who have excelled in the areas where Simons excelled: architectural design, historic preservation and urban planning. Dr. Sonia A. Hirt, an associate professor of urban affairs and planning at Virginia Tech, will talk Thursday about “Jane Jacobs and Urban Knowledge.” The talk, which is free and open to the public, begins at 4:30 p.m. in Room 309 of the College of Charleston’s Simons Center. The Preservation Society of Charleston has announced that National Trust for Historic Preservation President Stephanie Meeks will speak at the society’s May 10 meeting in the Francis Marion Hotel. This event is also free and open to the public and will include the society’s new 2012 Seven to Save list. “Ahoy there, Carnival,” Post and Courier, March 14, 2012, editorial. The non-profit Charleston Communities for Cruise Control has asked Carnival Cruise Lines questions that warrant some answers. In Carnival Cruise Lines’ 2010 sustainability report, the company reports on its efforts to be a “good corporate citizen” and “preserve the fragile ecosystems upon which we are so dependent.” Cruise Control members want to know how Charleston fits into their plans. For example, the report says “Carnival uses low-sulfur fuels voluntarily while cruising near environmentally sensitive as well as historical areas.” What about Charleston? It says Carnival has voluntarily adopted environmental practices in Alaska, California and Hawaii in order to “reduce smog and health pollutants” and “preserve coastal water quality.” Shouldn’t the same be adopted here? It says Carnival has committed to onshore power for ships calling at Long Beach, a measure that would alleviate air emissions here as well. Cruise Control is dedicated to achieving the appropriate balance between cruise ship operations in Charleston and the historic nature and quality of life in the city. As such, it wrote to Carnival requesting the cruise line adopt the same admirable practices in Charleston as it does in other areas. And a few more. Also, support the local and state economy by purchasing provisions locally. Avoid making loud announcements and playing music outside while in port as the noise reverberates between buildings and is disturbing to the community. Cruise Control would like Carnival to limit its presence here to two cruise ships a week — none with more than 3,000 passengers and crew. You’d think Carnival would be interested in burnishing its image given its recent problems — one cruise ship running aground in Italy and another being towed into port after catching fire in the Indian Ocean. But so far, Carnival has not responded to the Jan. 5 letter. In an open system of government, corporations typically can be called to account by citizens — and their elected representatives. But the city and the State Ports Authority appear more interested in running interference for the cruise ship company on the regulatory front. Indeed, no one at the SPA or on Charleston City Council — not the port director or the mayor — has yet responded to Charleston Communities for Cruise Control’s recent request for help convincing Carnival to use its best practices here. It was partly out of a sense of frustration that several neighborhood, environmental and preservation groups in Charleston filed suit against Carnival, seeking answers in the courts. Cruise Control, incidentally, is not part of that lawsuit. The questions raised by local critics shouldn’t be difficult to answer, and all who live or work in the area — including elected and appointed officials — should find an interchange of ideas worthwhile. Carnival has done the same for other ports. “Reduce the risks of air pollution from cruise ships“, Post and Courier, March 8, 2012, commentary, STEVE I. SCHABEL, M.D. One of the most important functions of the Charleston County Medical Society (CCMS) is to give citizens of the county advice on important issues relative to public health. In 2008 the CCMS proposed a resolution urging the South Carolina Medical Association (SCMA) to support “the maximum feasible reduction of all forms of harmful air pollution, especially new and existing sources of toxic fine particle pollution.” This resolution was adopted by SCMA in 2008, but stalled in the Legislature. Since then the arrival of the cruise ship industry in Charleston Harbor has again brought the problem of port-related air pollution to our attention. Without shoreside power, docked cruise ships run their engines and further pollute the air. This is easily addressed. After an extensive review of health data relative to the use of onshore power by docked cruise ships, the CCMS executive committee has asked the SCMA to take a stand. Its proposed resolution acknowledges that the average cruise ship discharges four times the amount of airborne pollutants, especially sooty particulates, compared to the average cargo ship, thus affecting residents and visitors when ships continuously run their engines dockside for hours while passengers embark and disembark. The effects of airborne pollutants have been shown to include increased chronic respiratory and heart diseases and increased cancer risk, especially among dockworkers, merchants and residents closest to the docks. That increases their health care costs. The use of onshore power reduces airborne cruise ship pollutants by up to 90 percent and is used frequently by major U.S. cruise ports without appreciable economic loss to the cruise ship industry. The American Medical Association supports reducing portside air pollutants and onshore power as does the Environmental Protection Agency, the American Lung Association and even the Cruise Lines Industry Association. In light of that research, the Charleston County Medical Society is asking the South Carolina Medical Association, the City of Charleston, the State Ports Authority, Carnival Cruise Lines and the S.C. General Assembly to work together to enact enforceable requirements for cruise ships to use onshore power rather than engine power while dockside. Our port facility is very near one of the most densely populated parts of our city. The added air pollution from cruise ship engines places an added health risk burden on those living and working near the port. Many other port cities on both the East and West coasts have mandated the use of shore power for docked cruise ships out of concern for the health of their citizens. The CCMS believes Charleston should take this important step as well to safeguard the public health. Stephen I. Schabel,M.D., is president of the Charleston County Medical Society. Copyright © 1995 – 2012 Evening Post Publishing Co.
“Why not shore-side power?“, Post and Courier, March 8, 2012, editorial. Cruise ship cheerleaders have labeled as misguided “snobs” those citizens who want cruise ships to be regulated in Charleston. They suggested that port jobs were being threatened. The State Ports Authority and the City of Charleston have ignored or refused requests for enforceable limits on the number and size of cruise ships that visit Charleston and on the air emissions those ships produce. Even Charleston City Council, elected to serve the best interests of citizens, shrugged its collective shoulders when asked to place such limits on cruise ships. It is a reasonable and appropriate request. Dr. Schabel refers to ports as places at high risk for particulate emissions that are harmful to people’s health. Cruise ships, he says, spew four times the air emissions than cargo ships. While in port, they must keep air conditioning and lights on, so they keep their engines running. But ports can — and many do — provide ships with access to electric shore-side power so they can turn off their engines and still operate. Those that do include Juneau, Seattle, San Francisco, San Diego, Los Angeles and Vancouver, Canada. Some have formed partnerships with utilities and municipalities to cover the cost of installing the shore-side power. Using it requires upfitting cruise ships too, but it costs less to use than running engines, and there are grants available to help cruise lines pay for the conversion. Some issues are debatable. But the benefits of shore-side power are not: better air quality, fewer emissions that can damage people’s health, no odor and no noise. The SPA and the City of Charleston might think those who want shore-side power are simply misguided, maybe even snobs, but scientific data say differently. The people who live, work and visit Charleston deserve a break from cruise ships’ risky air emissions. The Carnival Fantasy took off from the Charleston port on Monday and some local restaurants are noticing business isn’t booming when the cruise ship is in town. Days when cruise passengers get on and off the Carnival Fantasy are very busy down at the Port of Charleston. Passengers say they were just excited to get onboard, but some local restaurants are feeling the impact of these turn around days more than others. Eighty-four cruise ships are scheduled to visit Charleston this year, bringing in thousands of tourists to the holy city. But out of the 84, only 14 will call on Charleston as a port of call. The remaining 70 are turn around days for the Carnival Fantasy. “On days like today when it’s Carnival, as you can see we’re starting slow and they’ll trickle in and it won’t be the same impact as a port of call,” said Richard Coleman, manager of the Noisy Oyster. Coleman says when the Carnival Fantasy is in town, business for him slows down. A recent report commissioned by the Historic Charleston Foundation says many tourists spending money in the holy city are not cruise ship passengers at all. Another study by the College of Charleston shows nearly $37 million annually will come into the Charleston area as a result of the cruise ship industry and that 400 jobs will be created. Some restaurant managers also say road closures near the cruise terminal have an affect on business, especially with locals coming to visit. “Go green with cruise ships”, Post and Courier, February 12, 2012, editorial. In an effort to enhance the port and its reputation as a first-class place to do business, the State Ports Authority plans to build a new terminal with dual rail access in North Charleston, move and upgrade the passenger terminal and help port trucks switch to cleaner fuel. The port could further improve its operations by installing shore-side power for cruise ships calling here. The trend to cleaner power began in 2001 in Juneau. Since then, Seattle, Vancouver, San Francisco, San Diego and Los Angeles have added shore-side power. Brooklyn is coming online this year. Instead of idling the engines to keep lights on and air conditioning working while they are docked, shore-side power allows ships to hook up to the equivalent of a large electrical outlet and turn off the engines. That means less unpleasant air emissions. Of course, it also means expenses both for the port and the ship owner to add necessary equipment. The Port of San Francisco spent $5.2 million on its system. And while it takes $1 million of equipment for a cruise ship, officials say cruise lines will save in the long run. Power supplied by diesel runs around $18,000 for a 10-hour call while the new shore-side power averages around $16,000 for the same amount of time. Other ports have found creative ways to finance the improvements. For example, the corporation that manages Brooklyn’s cruise terminals will subsidize some of the cost of the power, as will the New York Power Authority. The remainder of the cost will be paid by the Carnival Corp., whose ships utilize the Brooklyn homeport. Carnival (with cruises originating in Charleston also) will spend millions to retrofit its ships that use the Brooklyn port. The Port of San Francisco is working with the San Francisco Public Utilities Commission to price shore-side power at a rate that’s cheaper than using onboard engines while docked. California regulations require phased-in shore-side power beginning 2014, so ports are reaching out to cruise lines to make them aware of possible grant funding available for retrofitting their ships. The shore-side power focus has been primarily on cruise ships, which idle for hours as passengers debark, visit a port and return to the ship. The diesel burns the whole time. And in Charleston, where the cruise industry is already a source of discord, shore-side power could be viewed as an olive branch — a way for the SPA to address one of residents’ concerns about the size and number of cruise ships and the pollution they cause. The timing is also convenient. The SPA is not yet finished its terminal design plans. Adding shore-side power up front while construction is under way instead of retrofitting later makes sense. The Navy has used shore-side power for years. Why shouldn’t Charleston? Adding shore-side power will require teamwork. SCE&G needs to be part of the plan, as do the SPA and its biggest clients. Shore-side power is quiet, clean and odor-free. It is clearly the right thing to do for residents and passengers alike. “Report on cruise industry should open the city’s eyes“, Post and Courier, February 9, 2012, editorial. A new report on the cruise industry’s impact on historic Charleston confirms concerns that preservationists, environmentalists and many downtown residents have been expressing. City Hall should pay heed. The independent assessment, commissioned by the non-profit Historic Charleston Foundation and prepared by financial and economic consulting firm Miley & Associates of Columbia, paints a much less appealing picture than the one put forth by the S.C. State Ports Authority. It finds that the SPA’s claims about the extent to which cruises boost the downtown economy are too rosy. It suggests that the city, which has declined to regulate the number and size of cruise ships in Charleston, should indeed ensure that the cruise industry is managed and controlled, as are virtually all other attractions and activities governed by the city. And it says the city, which provides many of the services required by cruise ships, should be receiving a portion of the parking and per-passenger fees (about $10 million a year) that now go to the SPA alone. But the report does elaborate on troubling cruise issues. For the last few years, the SPA has responded to complaints about cruise ships flooding the Market area with people, polluting the air and towering over the historic city’s fabled skyline, by providing information about the industry’s benefits to hotels, restaurants and merchants. Miley & Associates found that the hotels most benefiting from cruises are not in the historic city and that Carnival Cruise Lines purchases most supplies directly from manufacturers, not from local merchants. The study found that cruise ship passengers visiting Charleston spend only one-tenth of what other tourists spend. To date, the mayor and City Council have followed the SPA’s lead on the cruise ship issue. It is time for them to recognize that critics of the industry have legitimate concerns, which they, as elected officials, need to address. They should start with the proposal to put binding restrictions on the number and size of cruise ships. The SPA has said it will allow no more than 104 a year. HCF’s consultants recommend that the city should have a firm contract with the SPA, establishing who will own and control the portion of Union Pier that will be vacated when the passenger terminal is moved farther north, and who will pay for its development. Other good ideas include creating a citizens commission to oversee and advise council on cruise issues and commissioning an independent study to determine the resources that the cruise ship industry cost the city. The consultants concede the limitations in the scope of the study and recommend that an impartial economic impact analysis be conducted. It should be sponsored by those with a stake in the cruise industry’s future — from neighbors to longshoremen to environmentalists. Mayor Joe Riley has said that those who want city controls on the cruise industry are a small group of people who don’t understand Charleston and think it should feel more like a gated community than a real city. He bridled at the National Trust for Historic Preservation including Charleston, because of the cruise industry, on its watch list for endangered cities. This study acknowledges that the cruise industry indeed poses a risk to the historic charm of Charleston and could taint its excellent reputation as a world-class tourist destination. Supporters of the cruise industry shouldn’t dismiss this report the way they have dismissed residents and merchants who have registered concerns about the size and number of ships in Charleston and their environmental impact. And the city should pay close attention to its findings and recommendations, and not solely those made by the SPA. From either perspective, the stakes are high regarding the cruise industry. The city needs to balance cruise ships’ benefits and the industry’s impact on the ambiance and livability of the historic district. That balance is important to residents, tourism and the local economy. “Groups call for terminal study”, Post and Courier, January 24, 2012, DAVID SLADE. As several Charleston organizations with concerns about the cruise ship business await S.C. Supreme Court action on their lawsuit against Carnival Cruise Lines, they are continuing to press their case on other fronts. The Historic Ansonborough Neighborhood Association, Charlestowne Neighborhood Association, The Preservation Society of Charleston and the Coastal Conservation League — the groups suing Carnival — were joined Monday by The Committee to Save the City and Charleston Communities for Cruise Control in calling for an independent study of the location the State Ports Authority has chosen for a new cruise passenger terminal. The SPA plans to begin construction this year on a $35 million terminal, using an existing warehouse at Union Pier near Laurens Street, where there were previously cargo operations. The terminal, which was the subject of numerous public meetings last year, would replace an older one at the south end of Union Pier, near Market Street. Port officials have said Columbus Street Terminal, where $23 million was recently invested in capital improvements, is not an alternative, and is a focal point of the SPA’s growing non-container business. A spokeswoman said the SPA had nothing new to add in response to the latest call for an independent study. Charleston, SC: Six Charleston organizations—Historic Ansonborough Neighborhood Association, Charlestowne Neighborhood Association, The Preservation Society of Charleston, the Coastal Conservation League, The Committee to Save the City and Charleston Communities for Cruise Control—call for an independent merit-based study of the most appropriate location of a new cruise ship terminal planned by the SCSPA. The SCSPA’s website touts as a benefit to cruise operators that “Unlike many ports, Charleston’s passenger terminal is located in the heart of the historic district.” The SCSPA has stated that residents must accept cruise operations at Union Pier—with its industrial buildings and acres of parking—because Charleston “is not a museum”. But at the same time, the SCSPA tells passengers that they “can step back in time to the eighteenth century” and Carnival Cruise Lines calls Charleston “a living museum”. South Carolina statutes requires consideration be given by the SCSPA to “diminish or mitigate any negative effect port operations or expansion may have upon the environment, transportation infrastructure, and quality of life of residents in communities located near existing or proposed port facilities”. We have not seen such a study and believe only an independent study will adequately reflect a balance of port desires and residential, preservation and environmental considerations. Perhaps there is a reason that in other cities cruise ship terminals are not located in the heart of the historic district. The independent study should begin promptly and construction of the proposed cruise ship terminal at Union Pier should not begin before a determination, among various possible locations, which best balances all relevant considerations. “Full speed ahead to high court”, Post and Courier, January 22, 2012, editorial. It has been two years since the Historic Charleston Foundation organized a forum to address the need to strike a “delicate balance” of business, tourism and livability for peninsula Charleston. And for most of those two years, one topic has remained unresolved — and contentious: cruise ships. Both those who support unregulated cruises to Charleston and those who are calling for restrictions say it is good news that the S.C. Supreme Court has decided to play a role in the issue by hearing a controversial lawsuit. At least they can agree on something. The lawsuit alleges that Carnival cruise ships in port here should be subject to city ordinances including those regulating noise, building heights and signage. It was filed by the Southern Environmental Law Center last year on behalf of the Coastal Conservation League, the Preservation Society of Charleston and the Charles Towne and Ansonborough neighborhood associations. The State Ports Authority and the city of Charleston intervened on Carnival’s behalf. The Supreme Court’s decision means that, instead of the suit proceeding through the court system and eventually ending up in the Supreme Court, the high court will be the first to consider it. Meanwhile, the SPA is moving forward on its plans to build a new cruise terminal. The Charleston Communities for Cruise Control is hoping to persuade Carnival to agree to restrictions voluntarily as it has done in other ports. The Historic Charleston Foundation is awaiting results of an independent study it contracted for to evaluate the cruise industry’s impact on the peninsula. The city remains on the National Trust for Historic Preservation’s watch list as being threatened by the cruise industry. And there is a movement to convince the SPA to agree to an objective analysis of the port’s property and the most appropriate place on it for the new cruise terminal. Some believe that, by moving the site northward, the SPA would free up more land for valuable residential and commercial development. The SPA contends that it has looked at its options and made the best choice for port operations. In his recent inaugural address, Mayor Joe Riley referred to the “lively debate in our community about cruise ships.” He rightly said that local sights and sounds, including ships, are signs of a vibrant city. But he then attributed the debate to a few wealthy people who have moved to Charleston and expect it to be “like a gated community — affluent and exclusive” — an unfortunate dismissal of real concerns of a significant number of people, including lifelong Charlestonians and preservationists. A two-way, respectful discourse on the issue of cruise ship controls, as the Supreme Court should provide, will be a welcome step in this complicated issue. A civil exchange of ideas also would be welcome in Charleston’s civic debate on the issue. That civility should start with City Hall. Nearly two years ago, the Historic Charleston Foundation’s “Delicate Balance” forum challenged the city to develop a management plan for the growing number of cruise ships calling on Charleston. Today, after hundreds of articles, press conferences and letters to the editor, designations on national and international preservation group “watch lists,” and after enormous effort on the part of residents, local preservation groups and neighborhood associations, virtually nothing has changed. The city has failed to adopt a single meaningful standard or guideline regarding the number or size of ships that call here. Ships still idle engines continuously at a dock in the heart of the city, spreading soot and fumes across the Market, Ansonborough and the East Side neighborhoods. Traffic congestion remains a major problem even when there are no street closures. There are legitimate concerns on both sides. Achieving a “delicate balance” is indeed difficult. What is different, and despicable, about this debate, however, is the length to which the State Ports Authority has gone to vilify and stereotype citizens with whom they disagree, using public funds to do so. Everyone who is following the debate should understand that the resistance to cruise ship controls is, in part, a scripted campaign that relies on a steady stream of these types of inaccurate, irrelevant, often ad hominem accusations against cruise control supporters. The SPA’s public relations firm, Rawle-Murdy, has been paid almost a quarter of a million dollars over the past 18 months, in part, for its work on the cruise ship campaign. Rawle-Murdy also represents Carnival Cruise lines. The SPA approved “message template” is simple, and wrong. A June commentary piece in The Post and Courier from SPA chairman Bill Stern serves to illustrate its components. The first part of the strategy is to describe cruise control advocates as opposing not only all cruise activity but port operations in general, with devastating implications for the state’s economy, and to assert that we are motivated by elitism and snobbery. These points are demonstrably untrue and the SPA’s attempt to make it a “class” issue is insulting. We have consistently stated that we welcome cruise visits to Charleston, with enforceable standards and limitations. We do not believe the industry should be treated differently (e.g. unregulated) than any other type of tourism in Charleston. Still, someone has been posting a list of hospitality businesses labeled as opposing the port to discourage port friends from doing business with them. Again, false and insulting to Ansonborough and Charlestowne neighborhood residents. The tone of the conversation must change. As we move into the third year of the cruise ship debate, it is essential that we instill a spirit of civility in this and future debates about Charleston’s future. That we focus on facts, and that the SPA drop the divisive, publicly subsidized name-calling. Carrie Agnew is an Ansonborough resident who has worked in product merchandizing and architectural design. She is one of the volunteer founders and executive director of the Charleston Communities for Cruise Control (C4). “Endangered Charleston”, Post and Courier, November 26, 2011, editorial. The Trust warned that the Ashley River Historic District, with Drayton Hall and Middleton Place, was in danger of overdevelopment. It advocated for the Charles Pinckney house, the Penn Center on St. Helena Island, the Gullah/Geechee Coast and its culture, and Philip Simmons’ house and workshop — all of which were in jeopardy. This year, it put Charleston on a watch list of endangered places, specifically because of pressures on the historic city from cruise ships. But unlike earlier designations, this most recent one has been dismissed by some — including Charleston Mayor Joe Riley — as merely political posturing by a small, misinformed group. The mayor won re-election handily, but those concerned about cruise ships upsetting the city’s delicate balance of tourism, commerce and livability are not going away. And their numbers are not small. Recently David J. Brown, executive vice president and chief preservation officer for the National Trust, explained the Trust’s decision to flag the city as endangered — and debunked what some are saying about the move being politically inspired and inadequately researched. The Trust is seeking two things: a professional, comprehensive economic analysis of the effects of the cruise ship industry on Charleston that could serve as a model for other cities; and enforceable limits on the size and frequency of cruise ships calling on Charleston. While those goals were called for by local preservationists and some neighborhood associations on the peninsula, Mr. Brown said the Trust formed its opinion independently after research. For example, Mr. Brown referred to a College of Charleston study of the Preservation Society’s historic house tours, which found a little over 4,000 participants had a $2.5 million direct spending impact annually — $600 per visitor. That is in stark contrast to a study paid for by the State Ports Authority that showed more than 94,000 cruise ship visitors in 2010 had an impact in direct spending of just over $5.5 million — only $54 apiece. Soon, the Historic Charleston Foundation expects to get results of a comprehensive, independent economic analysis it has contracted for to provide firm data on which to proceed with the cruise ship conversation. The Preservation Society and its director, Evan Thompson, who have been strong advocates for enforceable limits, should also be part of that community dialogue. Criticism stings, and it is understandable that Mayor Riley is not happy with the National Trust’s “watch list” designation. But that same designation should be seen as a helpful alert — the kind that helped slow development in the Ashley River Historic District, save Philip Simmons’ house and workshop and preserve Charles Pinckney’s house at Snee Farm. “No deals”, Post and Courier, November 11, 2011, letter to the editor from BRUCE SMITH, George Street, Charleston, SC. Anyone who is willing to tolerate the ships, given their druthers and a clean slate would never allow them to dock in downtown Charleston. They will have learned from many other ports that placement of a terminal slightly removed from the hub of economic activity and the center of tourism with frequent and free transport to and from the center of town would be ideal. Harbors were never in the “center” of town, even Charleston, but on the periphery to avoid all the detrimental impacts they create. Why some are wedded to the current and proposed situation is beyond comprehension. We have a chance to do it anew, either north or east of the city’s center, the way our founders would have chosen. The economics of the industry are certainly attractive, but our public persona and the quality of our lives should never be sacrificed. Something’s changing. Why would anyone think the use of an old warehouse and a huge parking lot would be a smart decision? We shouldn’t cut any deal with the SPA until it is exactly what we all know and agree would be the best solution for the next 100 years, not the next five. On Nov. 2 the Fantasy was departing, and I could hear every one of the 35 “chimes” and announcements between 3-4 p.m. I am nine blocks from the terminal. “Curtail Cruises”, Post and Courier, November 10, 2011, letter to the editor from FRIPP ISLAND visitors to Charleston, SC. We are homeowners at Fripp Island, and frequent visitors to the beautiful city of Charleston. We are aware of the prospect of cruise ships gaining more access to the historic harbor, and are very distressed. We know concerns have been expressed by the Historic Charleston Foundation, the Preservation Society of Charleston, two neighborhood associations, the World Monuments Fund, the National Trust for Historic Preservation and numerous citizens, business groups, taxpayers and others. Despite this, the State Ports Authority is going ahead with its plans for a cruise terminal with no deference to these groups and individuals and their concerns about pollution, congestion, stress on the historic fabric and livability of the city or studying other locations for the cruise terminal itself. We join others in asking for help from the state Legislature to rein in the SPA to make it responsive to its duty to weigh the negative impacts of its operations, along with the potential positive ones, on residents and to be responsible as a government agency to serve the people. “Cruise lessons”, Post and Courier, November 3, 2011, letter to the editor from TENNESSEE visitors to Charleston, SC. My wife and I have visited Charleston several times over the past few years. We love the walks around the Battery and the historic district looking at the beautiful homes. When we first heard of Carnival Cruise lines coming to Charleston, we were both excited. We even cruised out of Charleston on the Fantasy in 2010 after staying at the Harbourview Inn a couple of days. We have cruised with them several times in the past and thought it was great to leave out of Charleston. We came back to Charleston in July of this year to celebrate our 10th wedding anniversary at the Harbourview Inn. We arrived on a day that the Fantasy was in port. Meeting Street was a complete nightmare. It took over 30 minutes after getting off at Meeting Street just to get to Vendue Range. It was almost like a lightbulb turned on in our vehicle. We both agreed that while we love cruises, we love Charleston even more. When we turned down Vendue and saw the pretty fountain at Waterfront Park, it was dwarfed by the Fantasy. The ship stuck out like a sore thumb. The black smoke coming out of the funnel didn’t help matters much. We checked in our hotel and then walked to Market Street for lunch. It was noticeably more crowded but we didn’t notice a lot of people shopping. We hope that your beautiful city doesn’t do like Gatlinburg and Pigeon Forge have done in the Smokies. Both cities started letting cheap T-shirt shops and arcades come into the city. This completely overshadows the beautiful mountains that we have. People who cruise could care less the exact location of the port in the departure city. They are concerned about ample parking and getting through the boarding process. “Not demons”, Post and Courier, August 2011, letter to the editor from STEVE GATES, C4 board member. cruise ship operations — deserves a full and fair hearing. to accommodate 4,000, and perhaps 7,000 or more, persons on embark/debark days. The cruise industry is growing rapidly, and demand could increase here. operate satisfactorily from these ports. Charleston deserves no less. to do with cargo ships or other port operations. counterweight to the SPA’s proclaimed unilateral authority. should be addressed and resolved civilly. Charleston was founded in 1670 by English colonists and relocated in 1680 to its present location, where the Ashley and Cooper rivers meet the Atlantic Ocean. Charleston’s importance as a port is reflected in the fine collection of buildings that epitomize American social and architectural history. Residential, commercial, administrative, and ecclesiastical buildings in Georgian, Regency, Federal, Adamesque, Classical, Greek and Gothic Revival, and Italianate styles dot the historic city. Charleston pioneered urban preservation in the United States as the first city in the country to enact a local historic district ordinance in 1931. Its protection is of national importance, not only because of its diverse architectural heritage, but also because of its critical role in the development of historic preservation policy in the United States. Charleston Historic District lies on a peninsula in Charleston harbor, which now accommodates massive cruise ships that release throngs of tourists into the city. The waves of increased visitors impact the city’s urban and social fabric, and the concerns in Charleston echo challenges faced in many historic port cities with cruise ship tourism. The conflict is between promoting local economies and preserving heritage and quality of life. The rapid, unregulated growth in cruise ship arrivals compels the development of a balanced and sustainable plan that will enable tourism as well as a thriving historic center. It is hoped that such a plan can serve as a model for many other historic port cities and towns worldwide that confront similar issues. “We Are Against Jobs!”,Charleston Mercury, October 4, 2011, Editorial. Now that we have your attention with an insane headline, let us advise that we believe we advocate and support far more jobs that the State Ports Authority. In his recent comments to Fox News, Byron Miller, spokesman for the SPA, said that the cruise ships bring jobs at a time when others are dissolving. Mr. Miller implies that those who want to reform the way cruise ships do business are going to reduce the number of jobs the cruise ships bring. No, sir, that is not true. Recall that we advocate moving the terminal up river to the Columbus Street Terminal where there is plenty of room for BMW and a cruise ship terminal. If we thought for a minute that a cruise ship terminal at Columbus Street would harm BMW’s export business, we would go back to the drawing board. The best and brightest have studied this matter in the C4 committees and agree that Columbus Street can handle expected growth of BMW and the cruise ships. In short, it seems that listening ears are turned off at the SPA and that my-way-or-the-highway is the tune of the day. If we wanted to live in a community where we fear potentates and business oligarchs, we would move to Russia; however, this is the place where we have stood up for freedom of expression for more than three centuries. For many years, we have also prospered by trading through the port. In terms of the jobs we see, let us inject that an upriver cruise terminal would give many citizens on the Eastside a direct role in shaping their future. The children at Sanders-Clyde would see passengers coming off the ships and going to a terminal named for Robert Smalls and then heading to newly constructed restaurants, stores and hotels in their neighborhood. Who, Mayor Riley, has lost faith in the Eastside? Cannot we see prosperous tourism business also dwelling in the heart of the Eastside of Charleston? Why should Downtown Charleston be the focus of all the tourists? Should we not create options so that capital investments and tourist traffic can flow where it is natural and sustainable? Of course, our SPA and Charleston City Hall could make a historic shift and embrace the winning solution that will preserve all the current cruise ship jobs, create a whole lot of new jobs and give our Eastside a chance to be in the game. Our fellow citizens near the Cooper River deserve an opportunity to have their businesses flourish in their own neighborhood instead of waiting for crumbs to drop from those who have been pulling most of the ropes since the earliest ships sailed up the Ashley. Aside from creating jobs on the Eastside, the C4 plan would put valuable waterfront on the market for new homes and commercial space, making Downtown Charleston even more vibrant and putting more tax dollars to work for the benefit of all. The SPA does not want to consider placing a cruise terminal at its Columbus Street facility; this remains the heart of the discussion and the point on which the future of the cruise ships business will turn. It is less important as to the total number of ships per year; rather, it matters where they dock and what kind of fuel they burn in port; it matters how the ships fit with the backdrops and entrance ways to the Lowcountry; and it matters that we never compromise with the quality of life of all of our residents. Most of us enjoy watching large ships coming and going through our harbor and estuaries all day long, knowing this is a financial boon for the state and part of along tradition. Nonetheless, they do not usually anchor off of Oyster Point and dump cargo at White Point Garden. They do not tie up at Waterfront Park and stack up containers by the condominiums nearby. It is just as ridiculous to bring up the aforementioned nonsense as it is for the SPA to regurgitate the mantra that its cruise ships critics are killing jobs. The real and sustainable visions for job creation will eventually take root, even if we must wait two generations to see them in action. In 50 years, will we be honoring those who guided our cruise ship decisions of today or will we be scrambling to change the names of public facilities and pulling down portraits and statues? “Are Cruise Ship Solutions Close at Hand?”, Charleston Mercury, September 20, 2011, Editorial. The Union Pier property is worth hundreds of millions of dollars, and it abuts a vibrant residential and commercial neighborhood that needs prime waterfront for expansion. This will improve the viewshed for nearby residents and visitors. The area around Morrison Drive and the Columbus Street Terminal can flourish together for the long term. Union Pier, as a host for cruise ships, will remain an eyesore and political albatross for the city of Charleston. We realize that the State Ports Authority’s plan for Union Pier is far better than what exists now, but it will not satisfy the citizens of Charleston or its key legislators. Senator George E. “Chip” Campsen III recently took up the cause of relocating the cruise terminal in an opinion piece for the Post and Courier. He is not anti-business and no radical; his support is most valued and welcome. The other Chip — Representative Limehouse — penned a letter with similar suggestions several days later. Meanwhile, the SPA, quoted in a recent Post and Courier article, continues to dismiss the shore power option for cruise ships. Byron Miller points to the high cost and how all cargo and cruise ships will have to switch to a cleaner fuel and different emissions controls; this process will start in 2012 and be complete by 2016. If the ships are going to have to retrofit to control emissions and burn different fuel in the future, it seems they would get ahead of the curve and make the changes faster, helping with public relations efforts. The problem is that the SPA has rejected general concerns about cruise ships burning bunker fuel, but they have lauded the upcoming regulations on what ships will burn in the near future. If the current soot is not a big deal, why is the SPA so insistent upon celebrating the upcoming changes in emission controls? The SPA has an opportunity to work through this issue and get Carnival to move faster with what shall be required. The citizens of Charleston deserve the cleanest air possible, and the empty ordinance from Mayor Riley is not the answer. In addition to the aesthetics and environmental concerns in the discussion, turn the page for moment to a pure policy discussion about economics and what is best for the SPA and the city of Charleston. The economic value of the Union Pier property speaks loudly; it yells on its merits; it screams best use; it oozes opportunity; and it cries for another path to solving the dispute. The central players need to find a way to sit down and agree that they will all benefit by seeking the best financial deal for the citizens of Charleston, the port and the city. “Council cruises off course”, P&C, September 15, 2011, Editorial. Charleston City Council had an opportunity to resolve the contentious cruise ship issue Tuesday night, but unfortunately it missed the boat. Council couldn’t even muster a vote on the reasonable plan, proposed by the Historic Charleston Foundation, to regulate the industry. Instead, council approved by an 8-3 vote an inconsequential ordinance, recommended by Mayor Joe Riley, that establishes a protocol for the State Ports Authority to follow if and when it seeks to increase cruise ship operations at its new Union Pier terminal. In contrast, the Foundation ordinance would have legally limited the number of cruise ships to the maximum number that the SPA says it wants — no more than 104 cruises here a year, only one at a time, and only up to 3,500 passengers apiece. Should the SPA want more, it would ask the city for permission. The Foundation ordinance probably wouldn’t have satisfied those who strongly oppose the location of the new terminal. But it would have addressed the objections raised by most of the residents who believe that the cruise industry poses particular problems for the city. And it would have removed Charleston — long a leader in historic preservation — from the embarrassment of being on a “watch list” of endangered historic sites. The National Trust for Historic Preservation put the city on watch status because of concerns about cruise ship operations in the city’s historic district. 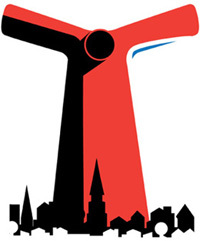 The passing of the HCF ordinance also would likely have resulted in the termination of a lawsuit against Carnival Cruise Lines, filed by the Preservation Society of Charleston, the Coastal Conservation League, the Southern Environmental Law Center and two downtown neighborhood organizations. Most important, it would have assured residents of downtown Charleston that cruise ship operations won’t get out of hand at some point in the future. It would have let them know that elected city officials are really serious about maintaining the balance between tourism and the city’s livability. The mayor has previously portrayed opposition to the cruise ship industry as a “tiny, radical fringe,” a novel characterization of those, including many downtown residents, who have the temerity to disagree with his position on the matter. Actually, they are people who live and work on the peninsula and who are concerned that the balance between the city’s tourism economy and residential livability is tipping out of kilter. And if there is anything elephantine in this issue, it’s the cruise ships themselves. There is an apprehension that without legal limits that there will come a time when the cruise ships calling on Charleston will be bigger and there will be more of them. Certainly the city of Charleston hasn’t demonstrated any reluctance to regulate other areas of the tourism industry. The Foundation ordinance doesn’t seek to ban or diminish the cruise industry. It only seeks to codify limits that the SPA already informally supports. The idea is to ensure that the very things that make Charleston appealing to tourists isn’t destroyed by crowding, noise, traffic and pollution. That’s not a lot to ask. City Council should have been willing to support the idea. “Evaluate all cruise terminal options”, P&C, September 13, 2011, Commentary, Representative Chip Limehouse. As a member of the Charleston Legislative Delegation I would like to urge the South Carolina State Ports Authority to explore the possibility of alternative locations for the new cruise terminal. Several options exist and should be reviewed, such as utilizing Patriot Point’s campus, where a water taxi system could take guests off the roads and instead transport them via the Charleston Harbor. The Post and Courier published a great guest column about the potential use of water taxis to transport cruise patrons and other tourists from Mount Pleasant downtown. This would ultimately give a boost to the Charleston Harbor tourist attractions. Perhaps Castle Pinckney could be redeveloped as a stop, too. The possibilities are endless. Another possibility for the terminal would be the Columbus Street area, which would allow private development at Union Pier. We have all witnessed problems caused by bringing passengers to crowded downtown areas to board cruise ships. Residents and businesses are delayed from going about their daily errands and jobs. Constant congestion has the potential to move jobs out of our city center. From conversations with merchants it appears that spending associated with cruise passengers is too modest to justify the negative impact on downtown residents and businesses. It appears that most passengers wishing to shop and dine downtown would be willing to take a short, scenic shuttle to and from the new terminal. A shuttle also would be needed to transport guests from the proposed terminal site at Union Pier, which is not within easy walking distance of downtown stores and restaurants. Furthermore, locating a cruise terminal in residential areas, particularly historic neighborhoods, is bound to have negative side-effects and lacks support. Finally, the sale of the entire 70 acres constituting the Union Pier Terminal could generate twice the jobs and future tax revenue as the existing plan to develop one-half of that property. At the same time, it would provide more public access to the waterfront. Many of our citizens are asking that we sit down and look at the preferable alternatives that currently exist before taking a rigid stance one way or the other. I ask that SPA and our city administrators take the necessary time to re-evaluate all options before making a decision that will affect generations to come. “Get city off watch list”, P&C, Editorial, September 13, 2011. Charleston City Council tonight can remove the label that is staining the historic city — its “watch status” among the 11 most endangered sites as determined by the National Trust for Historic Preservation. It also likely can end a lawsuit that the Coastal Conservation League, the Preservation Society of Charleston and several neighborhood associations have filed against Carnival Cruise Lines. And most important, it can take measures to guard the city against problems that might occur as a result of too many cruise ships with too many passengers coming here. City Council is scheduled for a second reading of an ordinance, proposed by Mayor Joe Riley, which is most notable for what it would not do. It would not put limits on the number or size of cruise ships. Instead, it describes how the city would respond if the State Ports Authority decides to allow more than 104 cruises a year or more than one ship at a time. It is, in a word, inadequate. In contrast, the Historic Charleston Foundation has offered an ordinance that City Council could adopt as an amendment to the mayor’s ordinance. It imposes reasonable cruise limits — the same ones the SPA currently adheres to. Council could adjust the limits upward should the SPA make the request, and should council deem it appropriate for the city. In making that decision, council would have the benefit of additional forthcoming information. The HCF has engaged a firm to do an objective economic analysis of the cruise industry here — data which could help members decide if cruise dollars warrant the difficulties that come with them. And the Coastal Conservation League says the HCF ordinance would satisfy its concerns and would likely make the lawsuit unnecessary. City Council members are elected stewards of an extraordinary city. That means protecting the city’s livability as well as its financial stability — two things which are intertwined. Without the city’s beauty, charm and culture, the city’s main industry — tourism — would be compromised. And Charleston residents’ quality of life would be diminished. As state Rep. Chip Limehouse writes in a letter on this page, cruise-related crowding and traffic pose problems for peninsula Charleston. Neighbors also complain of noise and emissions. Cruise ship business is good for the SPA’s bottom line. And the SPA is vital to Charleston and the state of South Carolina. It would be a mistake to allow this issue to foul a healthy relationship between the people of Charleston and the port. Other port cities have adopted reasonable limits for cruise ships without driving the industry away. Charleston deserves as much, and City Council should make it happen tonight. “Adopt stronger cruise ordinance”, P&C, Editorial, September 11, 2011. The divisive cruise ship issue, which has pitted Charleston Mayor Joe Riley against preservationists, neighborhood organizations and some otherwise loyal supporters, is not, as many fear, unresolvable. Charleston City Council has a chance Tuesday to amend an ordinance being promoted by the mayor. By doing so, it could help balance the peninsula’s livability and its business interests, and possibly to put an end to persistent discord, including a lawsuit against Carnival Cruise Lines. The mayor’s ordinance, which received the initial approval of Council by an 8-5 vote, lays out how the city would respond if the State Ports Authority decides to expand the number and size of cruise ships in port here annually. An alternative ordinance, prepared by the Historic Charleston Foundation, puts the city in the driver’s seat. The city would allow no more than 104 cruises here a year, only one at a time, and only up to 3,500 passengers apiece. Should the SPA want more, it would ask the city for permission. The mayor has insisted that the city has no authority to impose such limits. But HCF lawyers believe otherwise and cite a 1992 S.C. Supreme Court ruling as evidence. The court agreed with the city of Charleston that the SPA had to subject a building it was constructing to city review. The Preservation Society of Charleston has done its own research and notes that in 2003, the city’s own Cruise Ship Task Force recommended limiting the size of ships, courting luxury ships and establishing a passenger fee to cover the costs of public services. Nothing was done. Many people who live and work on the peninsula have complained that cruise ships cause traffic, congestion, noise and pollution. Sen. Campsen makes it clear that he values the port of Charleston as “the most powerful engine of our state’s economy.” Sadly, those who, like him, want firm limits, are being portrayed as anti-port, anti-jobs or simply snobs who don’t like cruise passengers. To the contrary, the Foundation proposal merely puts formal limits to what the SPA says it intends to do. It would implement other modest requirements to help maintain the “delicate balance” between commerce and the historic city — and the people who live there. Maintaining that balance is essential to the city’s tourism base as well. While the cruise industry is clearly profitable for the port, it is unclear how much spending it generates in the area. The HCF has engaged Miley & Associates to do an impartial economic analysis of the impact of cruises on Charleston. Those results should be helpful as the city continues to monitor the industry’s costs and benefits. If the character of the historic district is allowed to erode, the city will suffer. It is essential to protect its cultural and aesthetic assets. The SPA doesn’t want the city to adopt the Historic Charleston Foundation ordinance. Indeed, it contends that the city doesn’t have the authority. The state Supreme Court ruling says otherwise. The ace in the SPA’s hand is that it owns a large piece of waterfront property that Mayor Riley wants to see cleared of unattractive industrial buildings and developed. But a stronger city ordinance overseeing cruise ship operations shouldn’t preclude that redevelopment. And it wouldn’t chase the cruise ships away or otherwise threaten the State Ports Authority. City Council should support the Foundation plan on Tuesday. “SPA must weigh cruises’ impacts on quality of life”, P&C,September 10, 2011, Commentary, SENATOR CHIP CAMPSEN. My sons mark the sixth generation of Campsens engaged in Charleston maritime commerce. P.C. Coker’s quote therefore resonates in a very personal way. Not only as a mariner, but as a businessman and state senator, I increasingly appreciate Charleston’s port as the most powerful engine of our state’s economy. From Michelin and BMW in the upstate, to KapStone and Tire Kingdom locally, the port is indispensable to South Carolina’s titans of commerce. Yet this doesn’t mean all other considerations must bow before the port. As Kitty Robinson’s quote suggests, a balance between economic development and preservation of historic, cultural and natural resources sustains Charleston’s unsurpassed quality of Life. The good news is, economic development and quality of life are not mutually exclusive. Properly balanced, they are synergistic. Those questioning this synergy need look no farther than the industrial Midwest and Northeast, where quality of life was often sacrificed on the altar of economic development. In case you haven’t noticed, people have been fleeing places like Cleveland, Newark, and Detroit for years. They are moving to places like — well, Charleston — where we balance economic development and quality of life. Conservation and preservation are part of Charleston’s cultural DNA. Conservation arises from our agrarian and seafaring heritage, while preservation flows naturally from a culture that built an antebellum city without peers. Fortunately, this ethic conveys economic blessings. Travel and tourism obviously benefits, but so do all sectors of our economy. The Internet revolution enables people to transmit digitized work product around the globe at the speed of light. Many jobs are therefore no longer tethered to decaying urban centers. Mix this with the retirement of baby boomers, and people can increasingly live and work wherever they choose. This fuels population migration to places like Charleston, rivaling 19th century Manifest Destiny. The result is a 21 percent population increase for the Charleston region over the last 10 years, and economic resilience to the Great Recession. Mount Pleasant’s population has increased a dazzling tenfold from the 6,879 residents inhabiting it in 1970 when I attended elementary school there. This in-migration spurs economic growth. But that’s just part of the story. Expanding or relocating companies like Boeing seek business friendly environs with a high quality of life. When a CEO weighs a home on the Kiawah River against one on Cleveland’s Cuyahoga River, whose polluted waters notoriously caught fire, it’s a “no-brainer” as my father use to say. You’ll find the CEO teeing off on the Ocean Course at Kiawah. I authored S.C. Code §54-3-80(A)(3)(d) requiring the State Ports Authority Board to consider quality of life impacts of its operations. Lowcountry legislators need to hold the port accountable to fulfill this statutory obligation concerning several issues currently on its plate. The port’s first order of business should be rejection of the short-sighted paradigm that pits maritime commerce against quality of life as mutually exclusive. They actually work in concert. Secondly, the feasibility of utilizing part of the Columbus Street Terminal for cruise ships should be studied. This would spur redevelopment on Morrison Drive, mollify cruise ship traffic problems, and free more of Union Pier for redevelopment. Thirdly, as long a Union Pier is utilized for cruise ships, something akin to the Historic Charleston Foundation’s proposed ordinance should become binding upon the Port. This should be doable since all parties publicly support a 104 cruise per year limit; some just question whether it can or should be binding. But I see several ways it could become binding. S.C. Code §6-29-770(A) empowers Charleston to address the matter through zoning. And it certainly can be accomplished by contract or legislation. There is precedent for both. Decades ago the port settled a Wando Terminal lawsuit by limiting port activities there. Pursuant to 2002 legislation it redirected expansion plans from Daniel Island to the Navy Base, and contractually restricted northern rail service to protect North Charleston’s revitalization efforts. Last year it settled a suit regarding that same terminal with concessions. This raises another major quality of life issue before the port. Its contractual obligation that rail service not come from north end of the Navy Base Terminal should be honored. I’ve been in enough negotiations on the matter to conclude it can be honored with coveted dual rail access from the south. All that’s needed is a commitment by the port and state to honor promises made to North Charleston. Once that ground rule is established the details will fall in place. Economic development and quality of life are not mutually exclusive. Properly balanced, they are synergistic. Just ask your neighbors from “off” why they moved here. Quality of life usually tops the list. The Ports Authority should acknowledge this reality, and fulfill its statutory obligation to mitigate quality of life impacts of its operations. Chip Campsen, a Republican, represents District 43 (Charleston County) in the S.C. Senate.